My Favourite Films | emma etc. 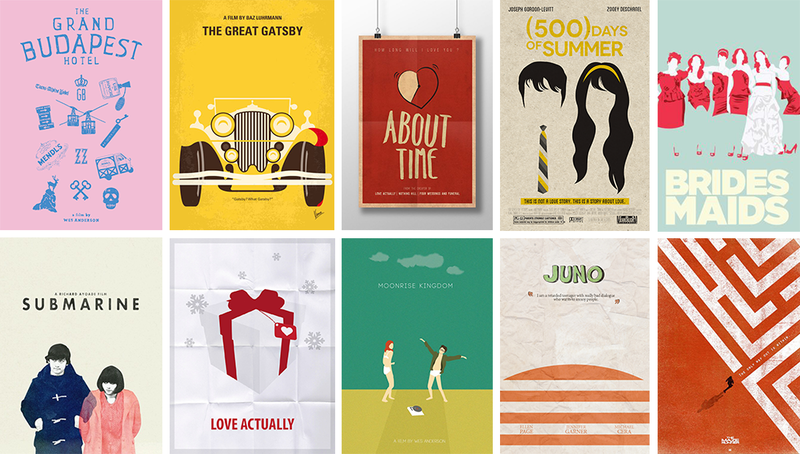 I rather enjoyed getting together all of these amazing minimalistic film posters for this post. All of these above are films I've really enjoyed/could watch again and again for a number of reasons so keep reading to find out why these films are so special to me. The Great Gatsby: Above everything I love the storyline and sweet sadness of this film (based on the book by F. Scott Fitzgerald of course; which I have read) as well as the beautiful 20s era. I love the whole look of this film; the clothing, the cars, the house/s. About Time: This film never fails to make me cry every time I watch it. There's something so nostalgic and sad about this film which is also uplifting and funny. It's from the director of Love Actually so it's no surprise I enjoyed this. Bridesmaids: This film is one of my favourite comedies. I die everytime at the part when Annie is driving the car trying to get Rhode's attention. I also love Rebel Wilson in it and all the antics that go on. Submarine: I've described this as my favourite film ever and I haven't changed my mind yet. It's a film I saviour with a unique and funny storyline. I adore Yasmin Paige and Craig Roberts and I adore Richard Ayoade, the director. I can't explain my love for this enough. Love Actually: This is my favourite Christmas film and something I will happily watch annually during the festive time. I love these type of movies which intertwine all of these different people's lives. Everyone loves a bit of Love Actually. Moonrise Kingdom: My second favourite Wes Anderson film and a completely cute and precious little film with perfect typography of title sequences. As I've said before, I just love Anderson's style of creating films and the unique shots he uses to make the movie humorous and slightly odd. I just love how this is about two kids running away from their families and the undeniable need to escape their lives in a silly, exaggerative way. Juno: I love Ellen Paige and I love the characters she plays. Her attitude of not caring and just carrying on with life is the only way I can explain it. If you haven't noticed already there's a theme running through these - I like quirky films. The Maze Runner: This last one is a bit of departure from the running theme in this post but I have to say I really enjoyed watching this when it came out in the cinema. I wouldn't say this is an absolute fave but a recent fave for sure. Other films I could mention here: The Sound of Music, One Day, Now Is Good & Back To The Future.